GitHub - zalmoxisus/redux-devtools-extension: Redux DevTools extension. Want to be notified of new releases in zalmoxisus/redux-devtools-extension? or run it in dev mode with npm i && npm start and load the extension's folder ./dev. or build it with npm i && npm run build:firefox and load the extension's folder ./build/firefox (just select a file from inside the dir). Note that preloadedState argument is optional in Redux' createStore. For universal ("isomorphic") apps, prefix it with typeof window !== 'undefined' &&. Note: Passing enhancer as last argument requires redux@>=3.1.0. For older versions apply it like here or here. Don't mix the old Redux API with the new one. 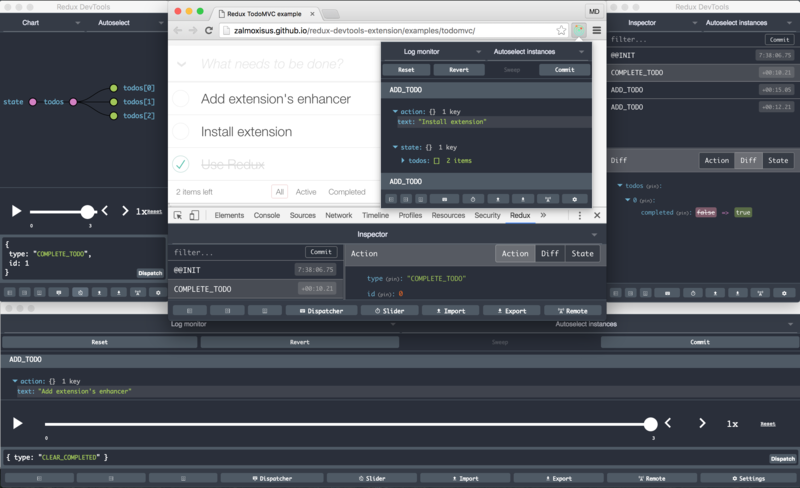 You don't need to npm install redux-devtools when using the extension (that's a different lib). It's useful to include the extension in production as well. Usually you can use it for development. You'll have to add 'process.env.NODE_ENV': JSON.stringify('production') in your Webpack config for the production bundle (to envify). If you use create-react-app, it already does it for you. If you're already checking process.env.NODE_ENV when creating the store, include redux-devtools-extension/logOnly for production enviroment. For most platforms, include Remote Redux DevTools's store enhancer, and from the extension's context menu choose 'Open Remote DevTools' for remote monitoring.